As expected, new ice cream parlors with liquid nitrogen (LN2) concept is blooming pretty fast in Jakarta. After pioneered by LIN Artisanal Ice Cream in Kemang and then the unique LN2 Ice Cream Private Catering Service by Elixcir Gelato, now meet the newest concept by RON’S LABORATORY. 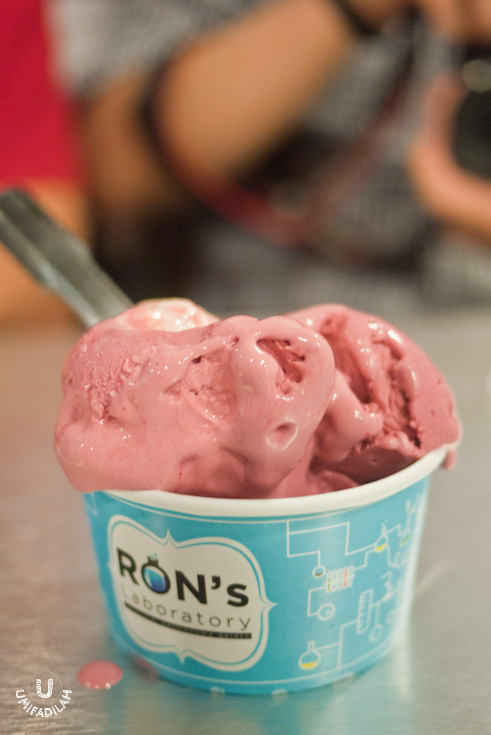 Located at West Mall 5th Floor, Grand Indonesia, Ron’s Laboratory – as the name suggest – wanted to make us feel inside an ice cream laboratory. The lab décor plays along with transparent glass divider, nitrogen pipe, beakers, funnels, colorful mixers, and white-coated staff with super cool goggles. 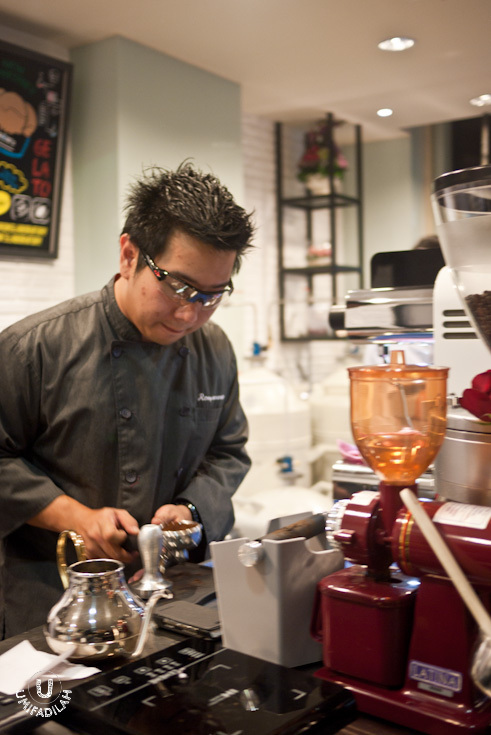 Meet Ronald Prasanto, the geeky man behind Ron’s Laboratory. He intended to keep the name sounded all scientific because it was his love of coffee + molecular gastronomy that started the business in the first place. He said that there will definitely be new flavors rotating every month, to keep loyal customers coming. Meanwhile, on the last week of October 2013 I had my chance to sample all five flavors of their Gelato: Red Velvet (IDR 60k), Avocado with Espresso (IDR 50k), Base with Caramel Swirl (IDR 50k), Dark Chocolate (50k), and Tape Ketan (IDR 45k); and also the only Sorbet flavor on the month: Lemongrass Sorbet (IDR 45k). Red Velvet (IDR 60k) – As expected, it really tastes like you’re eating liquid version of red velvet. Behind that velvety mound there’s a dollop of white mascarpone cheese that’s supposed to act like a cupcake frosting, I guess. Overall this is delicious for sharing, but not for personal consumption. Because honestly for IDR 60k? I’d rather pick a complete meal than some liquid version of a cake. Dark Chocolate (50k) – So I sampled two batches. The first batch tasted more like a milk chocolate instead with no bitterness from the dark chocolate. The second batch amends everything that’s just plain wrong with the first batch. It has that strong dark chocolate taste, more silky texture, and overflowing amount of choco chip. I guess it’s up to your fluke, then :) Hopefully they stay consistent! Avocado with Espresso (IDR 50k) – this one is still being the talk of the town up until now. The unique factor as you can see on the pic above is the way they presented the espresso “shot” as literal as it could: via injection. Well it should meet food grade safety regulation for plastic injection! Around 20-25ml espresso liquid is being infused onto the Avocado ice cream. I’m telling you, it’s probably Affogato in the most unique way! The avocado ice cream itself is a bit too sweet to my liking, and I feel like requesting another batch of espresso injection only to make a more bitter mixture. Base with Caramel Swirl (IDR 50k) – Vanilla ice cream topped with scraps of thin wafer with caramel swirl. Surprisingly not too sweet at all, love the simplicity. Tape Ketan (IDR 45k) – remember that Hula-Hula Ketan Hitam ice cream that we used to eat when we were kids? Yeah, this tasted quite like it, except that I need them to give stronger hints on the ice cream mixture. Needs to be more purple-ish! Lemongrass Sorbet (IDR 45k) – the one and only sorbet flavor on the house which turns out to be my favorite amongst the other (probably because I love lemongrass). 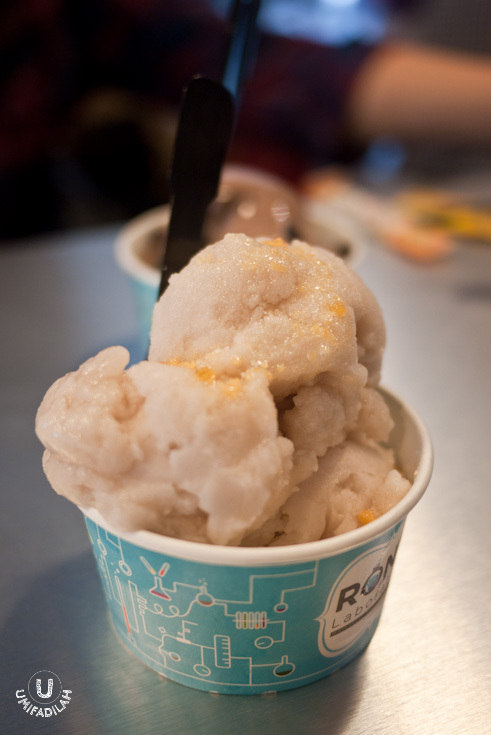 And the fact that they added magic pop rocks on top of the sorbet, creates a popping sensation in your mouth! Quirky yet so lovely, reminds me of childhood. Ron’s Laboratory has what it takes: great location, quite unique flavors that’s promised to change monthly, interesting concept & décor to invite the rich & curious people to try. But I’m guessing that location plays a big role here – if it hits the right audience, business like this will stay forever. For me, price-wise, I seriously doubt I will oftenly spend above IDR 50k for ice creams only, haha. Good for first timers though, you need to at least quench that curiosity! Creative Commons Attribution-NonCommercial-NoDerivs 3.0 License, © 2009-2018 Umi Syam.